I love all manner of pancakes, both sweet and savory, stacked short or tall. I'll take them as small as silver dollars or as big as dinner plates; made with buckwheat, corn and potatoes; filled with fruits, nuts and chocolates; topped with whipping cream or sour cream; and baked, griddled, steamed or fried. If I had my way (and the metabolism of a hummingbird), I'd eat pancakes every morning. When it comes to breakfast, there's nothing better than a plateful of sweet, golden flapjacks . . .
. . . Except, perhaps, a bowlful of sweet, creamy rice. Did I mention that I am also Rice Woman? I love all manner of rice, both plain and seasoned, sticky or fluffy. I'll take it as a side dish or as a dessert; from Bhutanese red to Japanese Koshihikari; topped with juicy meats and saucy vegetables; and baked, sautéed, steamed or fried. The way I grew up in a Filipino family, I have rice with nearly every meal - except breakfast. Now, I have found a rice dish that can claim the morning glory from my beloved 'cakes: Mahnomin Porridge. "In the earliest teachings of Anishinaabeg history, there is a reference to wild rice, known as the food that grows upon the water [which] their ancestors were told to find so they would know when to end their migration west." As I noted in an earlier post ('An Envious Appetite'), it is not actually a rice but rather a grass seed* which grows in abundance along the banks of Minnesota's northern lakes and rivers. However, increased demand has led to its cultivation in large commercial paddies that yield a hard rice that is darker in color and requires nearly double the cooking time than the naturally-growing variety (source: Wikipedia/Wild rice). Truly 'wild' rice is still hand-harvested in Minnesota using traditional Ojibwe methods and is the main ingredient in one of the tastiest breakfast dishes I've ever eaten. It's fitting that the sinfully delicious Mahnomin Porridge was created in Hell's Kitchen, the Minneapolis restaurant where author and Roadfood.com editor Michael Stern declared he would spend his last $20 to stave off starvation. Among co-owner and chef Mitch Omer's standout offerings are hearty bison sausage bread, delicate lemon-ricotta pancakes and a homemade peanut butter so scrumptious, I'm willing to aggravate my mild peanut allergy for spoonfuls of the stuff. But the most heavenly dish in this hotspot is the soul-warming bowl of hand-harvested Minnesota wild rice saturated in heavy cream and maple syrup, then topped with toasted hazelnuts and dried berries. After my first taste, all the other breakfast items - including pancakes - simply faded away. Stern has named Mahnomin Porridge one of 500 Things to Eat Before It's Too Late, from his book of the same title. For those of you who may not be so fortunate as to visit the Land of 10, 000 Lakes any time soon, I'm pleased to share with you the recipe for this hella good food. 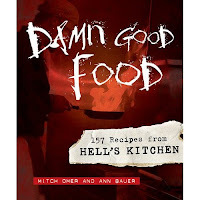 If you like it as much as I do, watch out for Mitch Omer's first cookbook, Damn Good Food: 157 Recipes from Hell's Kitchen, to be released in October 2009 and containing even more great dishes. By the way, a video recipe of that killer peanut butter can be seen here. Fair warning: after you've tasted Mahnomin Porridge, you may not want to bother with the remaining 499 foods on Stern's list. Google this dish and most, if not all, results will lead you back to Hell's Kitchen. On the restaurant's website, Chef Omer says he was inspired to create his recipe after reading 19th century trappers' journals that mentioned this food. Fortunately for all of us, he was generous enough to share it with local TV station KARE 11's Showcase Minnesota which, in turn, thoughtfully posted it on their website. Not wanting to break the spirit of sharing, I now pass it on to you. 3. Serve in a bowl with warm cream and maple syrup. Update 9/27/09: Above, I suggested using melted butter in the pan if you do not have non-stick cookware. However, this evening I had the pleasure of speaking with Chef Mitch Omer, who very nicely yet firmly noted that the flavor of Mahnomin Porridge would be fundamentally changed by the addition of butter. Instead, Chef Omer says to pour the cream into the pan first before adding the rice to prevent the latter from sticking. A little extra cream . . .
That sounds wicked good. I'm definitely making that asap. I'm a pancake person, too. But I think I give this a shot, if you'd give me a big bowl of that right now. That looks so good. Yum!! You have inspired me big time to try wild rice for porridge. It looks lovely! Hi Tangled Noodle, thanks for vising me too :D. Oh, I am SO a rice person myself. I'm so enlightened by your post! Really interesting writing & read :D and I would love to try this mahnomin porridge! Am sure it's packed with so much nutrients! Wild rice as a sweet breakfast porridge is a very interesting new idea - and so pretty to look at, too. wow that looks so good! craving for breakfast things in the evening...then again thats me! It's breakfast time here and that looks divine. I've never made porridge before but this I've got to try. I've got house guests coming in a couple of weeks and this would be perfect for one of the breakfasts while they are here. I immediately thought of the soft crunch and the delicate grassiness of the wild rice....great post! This sounds awesome! Not a big fan of wild rice but this looks great! OMG. Darlin' you have just discovered the key to my heart. This looks like a little bowl of heaven (even if it comes from hell's kitchen). This is way better than the cold bowl of bran flakes I had for breakfast this morning. I don't even care for wild rice, but this dish could change my mind. It looks soooo good! Maple syrup and cream? Outrageous! This is a breakfast my daughter would especially love! She is a big fan of rice and with berries, cream, and maple syrup - it sounds just perfect! I'm going to get my hubs a shirt that says, "Powered by rice" because the man could totally live off of rice. I'm not much of a wild rice fan but I would totally try this dish out! YUM! A sweet breakfast with wild rice, cream, berries and hazelnut, why not? GOSH!!!!!!! this look so delicious! I am going to copy this recipe. YUM! Hmm, I think I had something like this last time I was up at the North Shore. It was decadent and totally filling at the same time. Yum! Can't say I have ever thought about eating wild rice for breakfast. But yowza, covered with all that fruity and nutty goodness -- count me in on that! I could happily start the day with a bowl or two. I'm excited to be traveling to minneapolis in a few weeks and Hell's Kitchen is walking distance from my hotel! I'm coming from SF and love finding local specialties like walleye. Any other recommendations nearby? I'm a porridge woman. I love them in all forms, textures, flavours and temperatures. Gosh, I could just eat porridge and be happy. This is a great recipe. Will try it for sure! This looks positively divine!! And what a great fall comfort food. I have to have that book! I just told my husband about it and I pray he is pre-ordering it right now! I'd never heard of it - so thank you!!!! I concur to everything you said, sans the pancakes. I actually may be the only person who doesn't like them... but then again, I don't like Twilight (books/movies (the time of day is great) either!! Ha ha! Jenn - Thanks! I'm so predictable when we go out for breakfast; if order anything else (like eggs), it's always with at least 2 pancakes. But this really hit the spot! Anh - Yay for inspiration! Hope you'll enjoy it! Petite Nyonya - Thank you so much! Wild rice really packs a nutritional punch, in comparison to polished white rice. With the nuts and fruits, the health factor and flavor are boosted even more. Midge - I love champorado, biko/bibingka and all the other desserts made with sweet rice so I when I saw this on Hell's Kitchen's menu, I knew it would be delicious! HoneyB - Thank you! The rice was the most time-consuming part; otherwise, it comes together so easily! Sam - I made myself hungry for some this morning! Making the wild rice is really the most time-consuming part of this recipe but even then, it's not that bad. With all the dried fruits and nuts, it's wonderfully filling. Girlichef - We don't go there nearly as much as we should but Hell's Kitchen really puts out incredible food. I'm impressed that Chef Omer is willing to share his 'secrets' but I won't complain - I want this book now! Doggybloggy - Thank you! The texture you've describe is spot-on and so perfectly contrasted by the velvety cream! Pigpigscorner - Thanks! The flavor and texture of wild rice is awesome with this but perhaps another rice like basmati would work out, too! Susan - If there's one dish to change your mind about wild rice, it is really this one! The textures and flavors are really wonderful; maple syrup and cream really do make an outrageously delicious combo! 5 Star - Then, I'm sure she'll love this! Andrea - If you find that shirt, let me know - I'll want one, too! 8-) I mentioned above that maybe this could be made with basmati (or maybe brown rice?) to get the same chewy texture that goes so well with the creaminess! Gera - This definitely packs a nutritional punch and would help revive anyone after a hard workout! Elra - Thank you! I hope you'll enjoy it! Amy P - I know that Hell's Kitchen has an outpost in Duluth. And thank you for mentioning what I neglected to note: that a little goes a long way with this dish. Between the richness of the cream and the heartiness of the rice, it doesn't take too much to reach satiety with this porridge! Carolyn - I've only ever had wild rice as a savory side dish but the moment I spotted this on the menu, I just had to try it. This is really best with full, rich cream, which is the only reason I don't try to make a big batch for a week's worth of breakfast. Instead, it makes a wonderful Sunday breakfast treat! I'll let you know if I think of any other places! Marta - I'm sure you'll love this then! I love creamy textures, so rice puddings, porridges and oatmeal have always been faves! Reeni - Thank you! Seriously - as it gets colder, I'm going to snuggle up with a bow of this stuff every weekend! As a matter of fact, the first time I had this at Hell's Kitchen, it was an incredibly frigid winter Saturday - maybe that's why it made such an impression! That looks wholesomely delicious. I rarely make wild rice for the family but this looks like something I can make my kids ease into liking. I'm a pasta-freak and chocoholic who loves to eat buttermilk pancakes. But I might want to try this Mmmmmohimoh porridge. Looks good to me! This is one awesome breakfast!! It is certainly apart with using wild rice in the morning!! A must try for me!! I'm not a pancake person at all! For a congee lover, this sounds delicious, particularly as autumn is on its way. I'll get the chef of the house to make this for me one weekend! That dish sounds delicious and Hell's Kitchen certainly has a cult following, deservedly so, if this recipe is anything to go by. Wow, this sounds like a great breakfast! I want to go and buy some wild rice right now. Dawn - This dish could turn you mahnomin-mad! Definitely give it a try. Helen - As a congee-lover, I think you'll enjoy this! The grains are firmer than in congee but cooked a bit longer than suggested, they do 'blossom' out. Phyllis - It's so funny that our tastes (you & Kris, me and Mr. Noodle) are the same but inverted! I can tell you that my hubs loved this - and he does not like sweet or porridge-y breakfast foods. So it's a perfect compromise. If anyone can pull off tasting all 500, it would be you and not because of 'oink'. You're simply fabulously fearless about food! OysterCulture - We don't go there nearly as often as we should! They moved into bigger digs so hopefully that means the wait to be seated is not as long. At least I can get the book and have the taste experience at home! Lisa - Go for it! Justin - To say that it's like rice pudding wouldn't be accurate. The wild rice has a more chewy texture and nutty flavor that may be closer to steel cut oats. The heavy cream, I think, is critical because there's no natural starch to thicken it. Sorry for this subpar description but if you ever find yourself with a cup or two of wild rice (or you happen to be in Minneapolis), I hope you'll give it a try! Now that I think about it, I'm pretty sure I'm a waffle woman. Ha, ha! However a close second are creamy porridges topped with all kinds of natural goodness so this would be perfect. It's a new dish for me, but I couldn't resist all that sweet maple flavor with the beautiful berries and crunchy nuts. I'm so interested to give it a try. Im very much a pancake and porridge woman... it perhaps might be a tie, depending on flavours, etc. Now wild rice porridge is totally a first for me but wow does it look good! I lived in Mpls for two years while completing graduate school, and I sadly only made it to Hell's Kitchen once. My parents came for a visit and we headed over for brunch. Mahnomin porridge was one of our shared dishes - we all loved it! Thanks for the recipe! I love reading your blog because I always learn something new! I too am a rice girl. Your mahnomin porridge looks soooo delicious! It reminds me a bit of an Indian rice porridge dessert that my dad makes. what a beautiful dish - perfect wake up in the morning. Love all the exotic ingredients too. I don't even like porridge.. but this make me want some, now! I never knew they grew rice in Minnesota - neat! And this dish looks amazing! Actually, this is not my type of breakfast, I always eat more than this. But this would be a great ending for my breakfast:) I can have this fantastic looking dish as a dessert at the end of each meal. Your picture looks yummi-licous :-) lol. I rarely make food with wild rice, but this recipe looks too good. Think I'll look for that wild rice around the local markets here, if I can't find it maybe i'll turn to that online company. I just want a small bag to try this recipe with, sounds like a perfect breakfast recipe. Is the cream very rich? do you think I can substitute with milk? Awesome, never seen this before. I always serve it as a savory dish. I recently made a wild rice and orzo salad. This sweet treat is perfect for breakfast. And blueberries are so good for you, full of anti-oxidants. Great alternative to granola. Thanks! Just tried a variation of it, and it's delicious. Made one serving using: 1/3 cup of cooked pearl barley, 1/2 cup of wheat berry, 1/5 cup of toasted walnuts, 1/4 cup of heavy cream, 2 tbls of milk, 1 tbls of maple syrup, and some blueberries, raspberries, strawberries, and blueberries. Thanks for the recipe. This looks so good! I love rice when it's used in sweet applications... a variation with alternative grains would be amazing. I've totally had the pleasure of eating this and it's amazingly good. Now I'm really stoked to be able to make it at home. Thanks for posting the recipe! We're having an extended summer in Minnesota! So beautiful outside this weekend that I've been neglecting my blog . . . so many thanks for all the new comments! Jennifer - I consider breakfast to be my favorite meal b/c it's really the only one where sweet flavors don't have to wait until the end of it! Hope you give this a try. Jen/Savor - You'd be surprised: the wild rice has only a slightly 'chewiness' to it (like steel cut oats) but is otherwise quite tender. As for subbing agave nectar for the maple syrup, I think that sounds great! Please let me know what you think - I haven't tried agave nectar yet and it sounds delicious! Carrie - Thank you! This dish altogether is so deliciously satisfying. ValleyWriter - The wild rice I used is actually harvested from lake and river shores, so it's a little pricey but with great flavor. But I was so surprised that Minnesota has large commercial rice paddies as well - I wonder what they look like? MyCollegeKitchen - Thank you! I hope you will try it. Heavy cream really is quite rich (and full of calories) so using milk would be fine, although the porridge won't be as thick and creamy. I would suggest using a some arrowroot starch as a thickener! Anonymous - Wow! What a great combination of grains. I will have to try out your variation - I have barley and wheatberry just waiting to be used but you have me totally beat on the berries! Lo - Check out the previous message from Anonymous, who used wheatberries and barley! I think alternative grains is a great idea and gives us so much more variety for porridges and puddings. Kate - I was so hooked with the first spoonful at Hell's Kitchen that I was weirdly thrilled to pieces when I found the recipe! I hope you'll enjoy it! What an interesting porridge, I love all the yummy fruits! I love this! And wild rice is an old favorite of mine. (I actually have some in my pantry!) And thanks for the info about the cookbook. What a life he had led! I love you, Tracey. Seriously. Wild rice for breakfast? With a cup of heavy cream? Yes, please. Plus, I can't tell you how much I appreciate your going the extra mile to explain some history behind the dishes you share. You rock! this looks phenomenal. i hope to try and make it this weekend. thanks also for the great education, as always. How interesting and it's great for breakfast. Thanks for the most recent comments! Barbara - Great! It's so delicious and I can't wait to see what other recipes will be available in the cookbook. Maria - A great way to start the day! OPC - Oh, you are too sweet, considering that I haven't visited in ages! Thank you so much!! Lee - Thank you! Knowing the effort it takes to hand-harvest the rice, I find myself taking my time savoring every bite. momgateway - This has such a great combination of different textures, and is all-sweet, in one bowl! I'm always learning things from you. I've never in my life heard of mahnomin, and to me it sounds like some kind of prescription drug. But it looks absolutely delicious -- and simple, which is one of the best parts. Who wants a complicated breakfast all the time? I love rice pudding. I too am rice woman, btw. :) Never heard of making it with wild rice though - will have to give this a try! Could it be that you have uncovered the dish that will finally reverse my aversion to sweet rice dishes? I think that you may have done just that. Bookmarking this and putting wild rice and maple syrup on my shopping list! I just happened upon his post through food gawker. I had no idea this recipe was in any books! I love this porridge! I have wanted the recipe for so long. Thank you for posting it!